Mitt Romney, Susana Martinez, ABC’s Tom Llamas, CNN’s Jim Acosta, vets, his own supporters—and more! 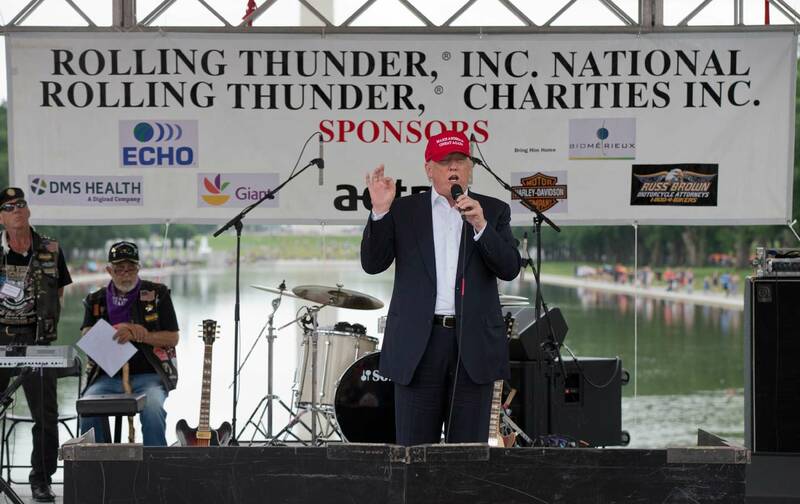 Presumptive Republican nominee Donald Trump spent the weekend insulting his own supporters, a group of veterans known as “Rolling Thunder” who ride motorcycles to Washington, DC, on Memorial Day, for turning out in insufficient numbers to show their fealty. Comparing himself to the Rev. Martin Luther King Jr., Trump chided the vets for not filling the National Mall as civil-rights supporters did during the March on Washington in 1963. “I thought this would be like Dr. Martin Luther King, where the people will be lined up from here all the way to the Washington Monument,” Trump told the estimated crowd of 5,000. “We got to do this for next year so Rolling Thunder allows everybody in,” he urged, after a hard to follow explanation of how crowd control dampened turnout. The Tuesday press conference also gave the lie to GOP predictions that Trump will become more “presidential” as the campaign wears on. In fact, Trump denied this himself. “You think I’m going to change? I’m not changing,” he told a reporter who asked if sarcasm and insults would be the trademark of press conferences under President Trump. He also continued to mock and deride Republicans who haven’t endorsed him, standing by his claim that Mitt Romney “walks like a penguin” and that New Mexico Governor Susana Martinez has run her state badly. The reason for Trump’s press conference was to let him slag the media for questioning his honesty about donating $6 million to veterans charities. Trump read aloud a list of donations to vets’ groups that he said added up to $5.6 million. The truth is, no one has had a chance to fact-check Trump’s claims, but even if they are true, it also remains true that the mogul himself had not made good on his own $1 million donor pledge until the Washington Post piece—and Trump has no history of supporting veterans’ causes. If he’s made good on his promise, at long last, it seems to be entirely for political show. Indeed, Paul Rieckoff of the respected Iran and Afghanistan Veterans for America says his group was offered a donation by Trump last week, but turned it down because it wanted to keep its distance from the opportunistic showman. On Tuesday, though, journalists seemed most upset about Trump’s persistent insults to them directly. He called ABC’s Tom Llamas a “sleaze” and sarcastically labeled CNN’s Jim Acosta “a beauty.” Trump also claimed he hadn’t publicized his plans for the donations to veterans groups because he wanted to keep his plans “private,” even though, as incredulous journalists observed repeatedly, he had made the pledge at a grandstanding public event designed to draw attention away from the Fox GOP debate the very same night—which would seem to be the opposite of private. Sometimes it seems that the media get more upset about Trump’s abuse of their own members than his slurs against Mexicans, Muslims, women, Democrats, Hillary Clinton, Bill Clinton, Vince Foster, and the handful of #NeverTrump Republicans who oppose him. Whatever it takes to prod more critical Trump coverage at this point, I’ll take it. Trump’s Tuesday meltdown was a new nadir of petulance and bullying, continued evidence of his inability to pivot to “presidential” behavior even after winning the delegates needed to become the nominee. This level of thin-skinned hysteria plays well with the GOP base; there’s no evidence it can win a majority of American voters.